Ahhh…the age old question: If you’re handed a bucket of dog poo, and your birthday falls on a… Wait. Not that question. That’s for my OTHER blog. Let’s start over, shall we? 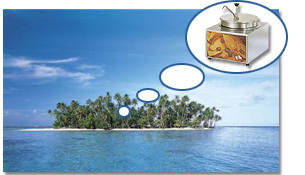 Ahhh…the age old question: If you were stranded on a deserted island and allowed only one food, what would it be? Everyone’s got an answer. And everyone’s got a reason for their answer. You’ll come across the burrito people, the pizza people. But if you asked me, I will always answer decisively and without hesitation, "NACHOS." But then I started engaging in that dangerous pastime — thinking. Could nachos be the best choice? Would I even be able to survive on nachos alone? I am fortunate enough to work at a company that provides nachos on a weekly basis in our cafeteria. The nachos are reasonably priced…but I’ve discovered a hole in the system to get FREE nacho cheese. In the cafe, nacho’s cost $3.00 for a small bowl while a small basket of french fries cost $1.50. We all know that the cheese is were the money is. However, if I take my $1.50 french fries over to the nacho bar, smother it in steaming hot cheese, and walk it over the register, I am still only charged $1.50 for my fries! We’re talking free nacho cheese fries! Last week, I even topped it off with some chili and still paid the same price. Chili cheese fries for the price of regular fries?